After visiting various places last weekend, we drove through Helensburgh into a beautiful conservation village. You definitely need to have some wealth to have a place here, big – big mansions. Right now I can’t even afford a house, so places like these are only possible in dreams. So we just decided to keep on driving and admiring. 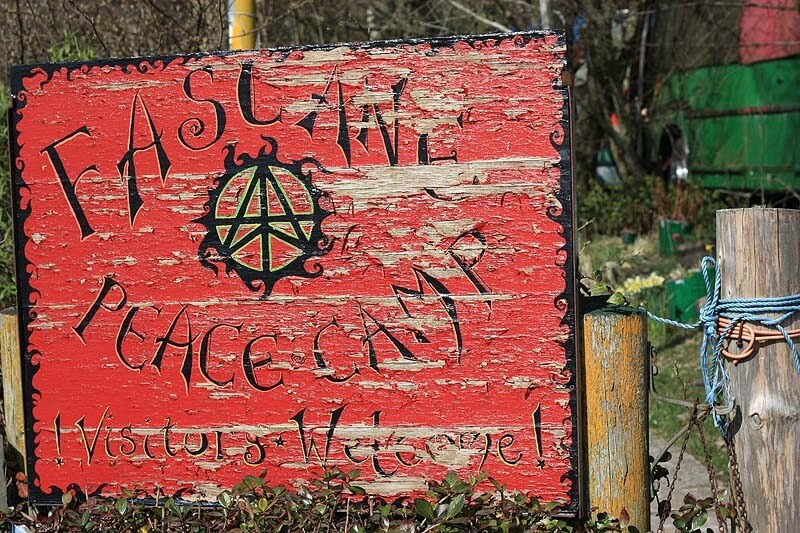 Then we came across Faslane Peace Camp. 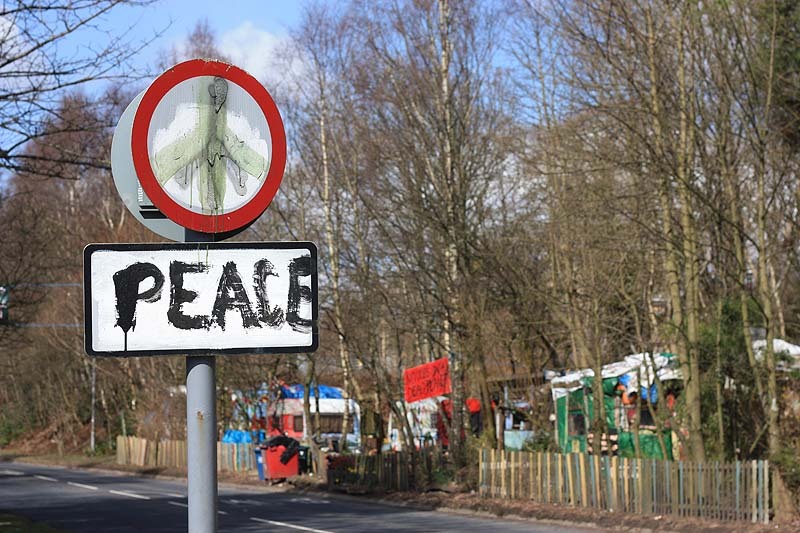 During my student days I had always wondered where it was, as I was quite familiar with the Greenham Common Womens Peace Camp. So you can imagine I was quite glad I accidentally stumbled upon this. 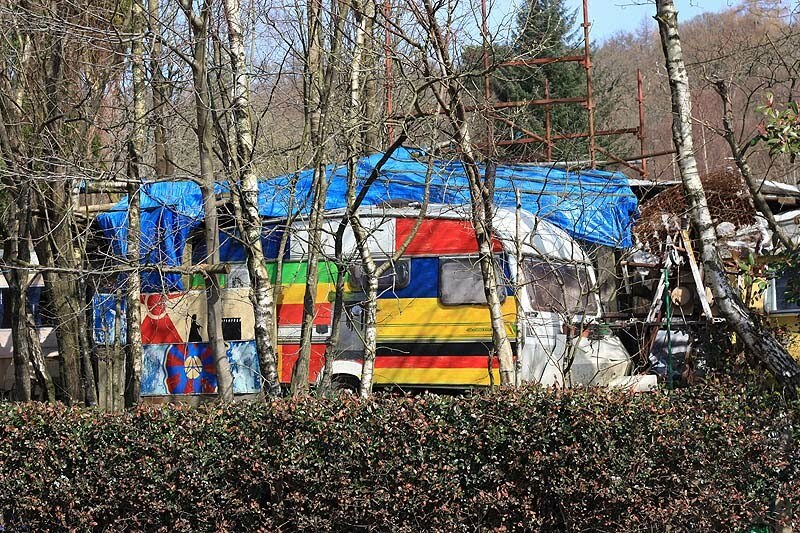 I wondered how this new community were received by the then residents, perhaps perceiving that ‘these hairy hippies’ would spoil their haven and intimidate tourists. (Have they been to Glasgow city on a Friday or Saturday night!?). 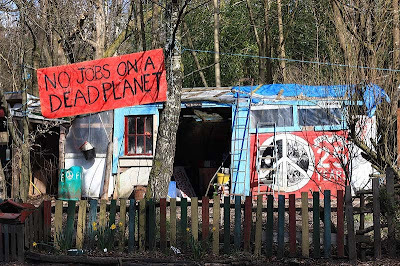 I personally think Faslane Peace Camp melds in beautifully with its natural environment. I was welcomed in by the sign on the gate. So I had to just go in and have a nosy around. I walked in, just absorbing the colours, the wind chimes and the messages of which there were so many. Then the gardener in me stopped to observe a woman digging a small plot. 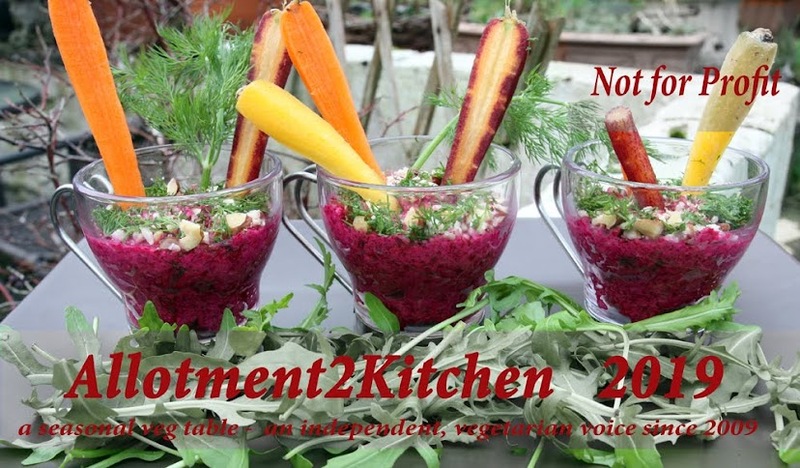 I asked ‘Are you growing vegetables here?’. She smiled and said 'there used to be a caravan here'. So to make the most of the spot, she had decided to plant some sunflowers out. Later I wondered if it was the one that I saw not too long ago at the museum. She did introduce herself, but as I am posting this late, I can’t honestly remember her name, but she was really warm, friendly and welcoming. I really appreciated her taking the time to stop and talk to me, people always seem to be in such a rush. After her telling me a bit more about the peace camp, I took a few more steps, saying hello to other fellow Peace Campers who were having brunch and playing chess, until I reached the end of my unexpected visit. It was good. I enjoyed it as much as I enjoyed visiting the National Trust for Scotland property, and this one didn’t cost me a penny. Some people may say the Faslane Peace Camp is ugly in such a place of beauty, but I completely disagree. If you drive on, within minutes on the left hand side, there was the monstrosity of fencing and barbed wire. Not to protect what was inside, but to keep people out. It really was an ugly sight, blocking the beautiful views of the water and occasional blue skies. Your husband must be a bit like mine. He would raise his eyebrows. 10 years ago, even 6 years ago I would have considered living in a place like this, and 'roughing it' but with time I have become more comfortable with my creature comforts. Plus its not just about me now, I have others to consider in my life now, before I was more single and free...different lifestyle; different world; different time. This place looks fascinating, I would love to visit. Reminds me of my youth in CND. I like to see people like these. They fasinate me. To give up all and just live. Be in the world and not of the world. Different but interesting. 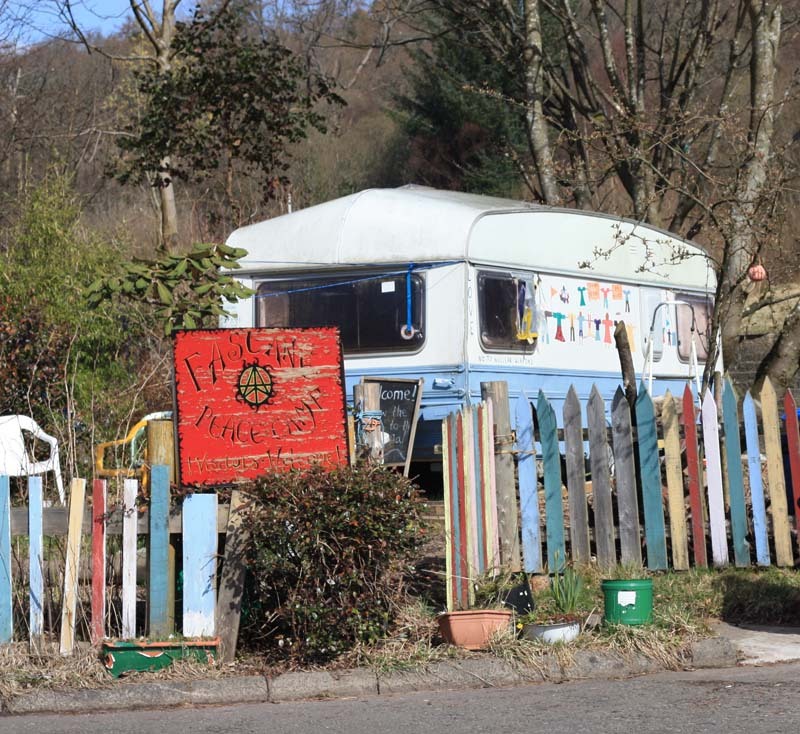 That looks amazing, I always have in the back of my mind the thought that I should just go and live in a commune or something, it's a bit scary to turn my back on everything that's 'acceptable' though, I'd definately like to visit one though! Those caravans are soo pretty too! We don't have places like that around my neck of the woods. It would be fascinating, after all we all are just travelers through life! Thanks for coming by Moy, hope your well. I agree Catsngrams, it certainly does take a certain kind of person to give up lifes little luxuries. 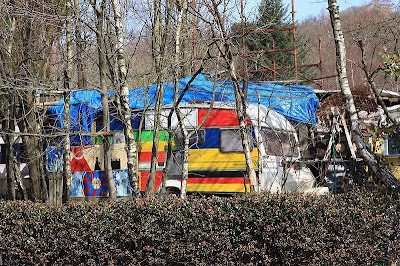 Every caravan was colourful and had a 'political' message. Thanks Rose. I hope your well and that your now in the stride of your new job. Thank you so much Missy AKA Little Messy Missy. You are right, in some way we are all travellers and 'tourists' too. This is amazing. I've always wondered where all the UK hippies live - in fact, I wasn't sure if they even existed, which made me feel a little lonely I admit. Back when I lived in Austin, TX, I was surrounded by "Faslanes". Now that I'm in the UK, I haven't found anything like it. Sounds like I need to go on a road trip. I'm missing out! I want to apologise. 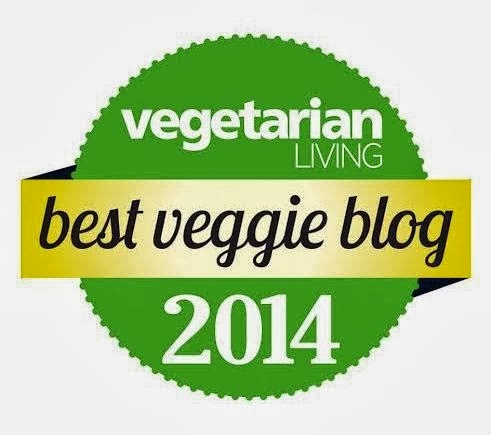 I think I may have given the wrong impression in my blog entry. I also made the mistake of assuming my readers would know the significance of Faslane, hence the link. The U.K no longer has a hippy community in the 1960s sense. A number of UK hippies went on to become 'weathy' people, turning their backs on humble living, with some of them becoming little capitalists. The 'hippies' I am speaking about here only resemble the 1960s hippies in fashion. 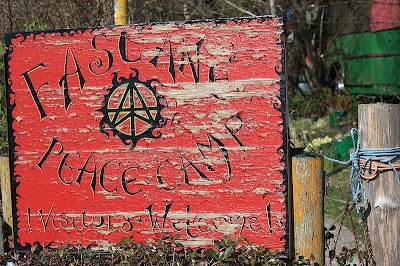 The Peace Camp residents at Faslane are 'politically' active against the Faslane Naval base, hence their close residence. In the past they have occasionally breached the security of the Naval Base by getting inside the ugly barbed wire fencing I wrote about; or by disrupting the road transportation of the Trident missile warheads. 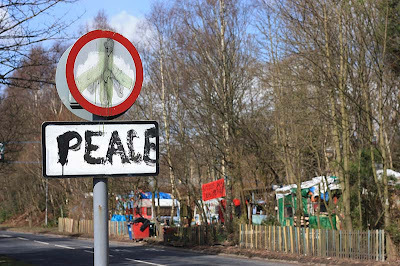 They are also active, with Trident Ploughshares and CND in large public blockades of the base, attended and supported by members of the public and a few politicians. The peace camp is a home for the protesters. I hope this further information is helpful.